You can find out more about it by clicking the link, but I can tell you now: it looks pretty impressive. I was sent a copy to review, and I was a little worried it might go over my head. I'm not the most technical of people. I think perhaps I'm much better with a very low-tech pencil and paper! I needn't have worried. The learning curve is quite a gentle one (although I'll admit I'm still on the nursery slopes!) and there are hints on the page as you are using it - they're quite subtle and not at all intrusive, so look out for them as you may miss them to begin with. If you do find the learning curve a little bit too steep for your liking, you'll find tutorials in the Magix online magazine as well as their You-Tube channel, so there's no need to feel like something is confusing or insurmountable. There's even a forum to ask questions (you'll discover it during the download process). As a former teacher, I really like the fact they've made allowances for different learning styles and preferences in the presentation of their information. 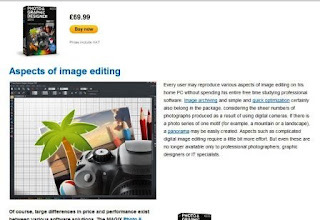 Photo editing software is useful for pretty much anyone, but especially useful if you sell your crafts online: we all know how important a good image is when buying and selling... it's what your customer uses when deciding to buy. You can use Magix photo-editing software for videos, too - which are a great way of increasing views to your blog or website (Google does love a good video!). 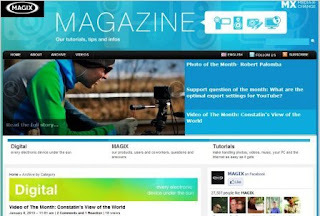 Magix also run competitions on their Facebook page so it might be worth popping over there for a like! If you'd like to win a copy of this software, please leave me a comment on this post telling me why you'd like to win it - that's all you need to do! Winners will be picked on Friday 1st February at 12 noon, UK time and will be announced shortly afterwards. Thanks for entering and good luck! The lucky winner will be sent a download link and activation code by email, so it's open to anyone, anywhere in the world (there's no physical product, it's all done digitally). This giveaway is number three of five - all happening this week! Click the home button to scroll through the other blog posts. Because.....i buy lovely fabric and turn them into lovely things for lovely people. But, quite frankly my photos are rubbish! I've just checked out the video and I love the erase feature and changing the backgrounds would be a great addition to my photo's. I keep reading help for new online craft businesses which stress how important pictures are. I would really like to put this advice to good use with this software which seems looks like it will change photos into how you would like them to look - as if by magic! I've always struggled to get my photos just right for my store and this little bit of kit looks like it would do the job nicely. This sounds wonderful. Why would I like it simply because my photo's look awful. I definitely need some help. I would so love to win this because my photos are really holding me back, I just can't get the right light and no matter how much research I do I can't seem to get it right!! I neeeeeeeed help!!!! When I look at the picture I am taking, it looks good. Not sure what happens after that, coz a gremlin attacks them and the majority turn out to be ones you wouldn't even hide at the back of a box. Thank goodness for digital cameras, saves all that money being wasted on developing photographs. This software would help ensure all pics were printable. What a nice idea...so many of us can't begin to afford Photoshop, etc. so this would be a wonderful prize..like you, I'm no techie, but hopefully this would become second nature.. I take photos of any crochet/knit/felted items i've made, plus use photos for my blog and of course any travelling that i manage to do! i have always wanted the opportunity to play around and edit my photos and make them arty, so this software would allow me to experiment! Oh my goodness do I need this. Tried two others and just can't hack them far too complicated. My photos were not too bad but recently I think I must have changed some settings but they are awful :-(( not a clue what I have done. I'd love to win this giveaway as I am about halfway there with photo editing, but need to find a good package to learn all about and really get good with! I want to win this because its a powerful software that is comparable with Photoshop. My daughter love play with digital photos. I would like for her to win this soft. This software looks awesome! I'd like to be put in to win it please and thank you! Happy 100th Handmade Monday and thanks for giving us all such great opportunities to win such cool things. I would love to win this so I can improve my post pictures and do a little picture art for the house. My daughter would love this for her beauty blog. Then she can help me take better photos of my craft projects! Wow, i realy like to join this give away! I want to turn some of my sketches and crochet into postcards and business cards. This software and the support with it (I just peeked at one of the YouTube videos) would enable me to do that. And get on with the crochet booklet I keep threatening to write! I would love to have this software to craft my graphic design skills! I don't have any software at home that I can use that's like this! I'm hoping to start a blog in 2013 and this would be so useful as my photography skills are pretty rubbish. I always spot something in the background that shouldn't be there when it is too late to retake the photo. I'd love to win to help me play with some of the pictures I take.